Greetings! With the leaves starting to change colors, the wonderful Fall weather we’re having here, and the trip to an apple orchard I took last weekend, I’ve really been feeling in the Autumn spirit lately. 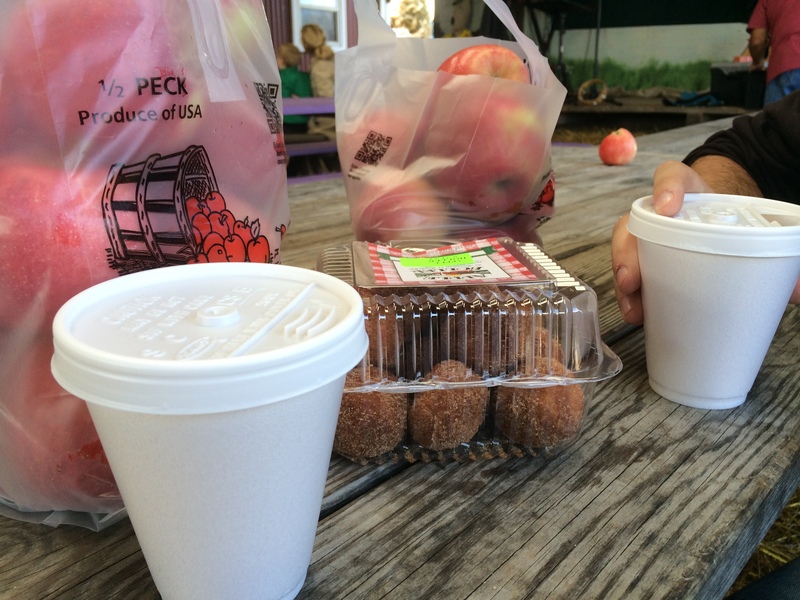 Dan and I went to Apple Holler, an apple orchard about 30 minutes away from Milwaukee, to pick some apples and buy some fresh cider. We were happy to see that they have an abundance of apples this year and we picked tons of delicious looking Honeycrisps (my favorite! ), Fujis, and Galas. 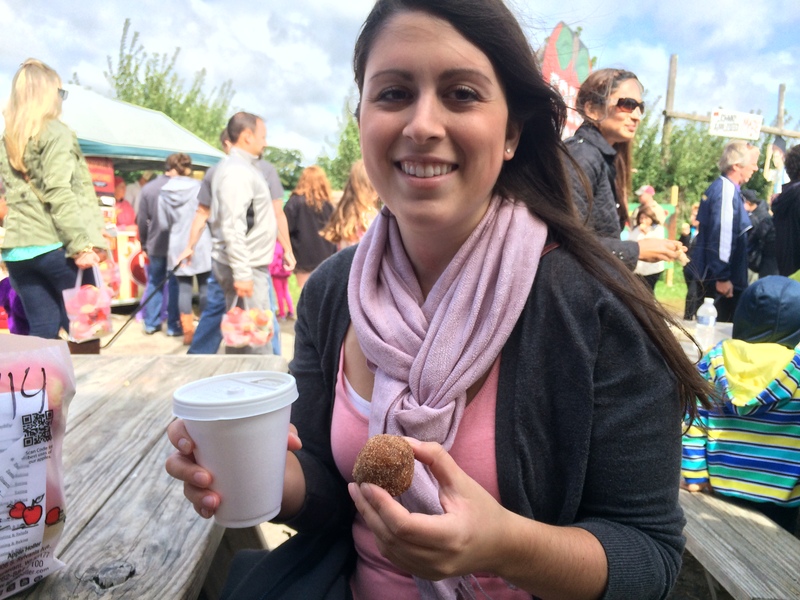 I also got 1/2 a gallon of cider and a couple caramel/chocolate covered apples – my weakness. The best part had to be Dan asking the cashier for 5 gallons of cider amongst giggles from the staff and other customers. He’s brewing an alcoholic cider, but people definitely thought he was a little crazy/obsessed watching him carry all that back to his car. 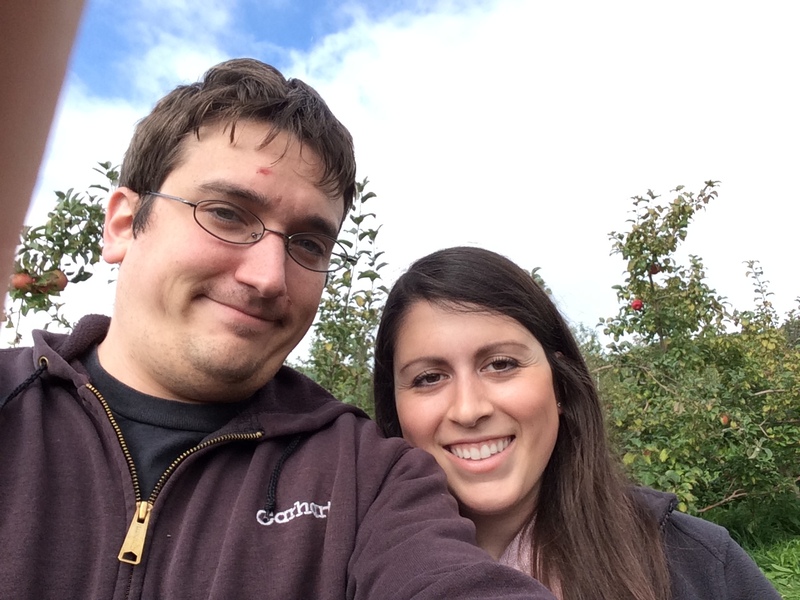 Has anyone else gone apple picking yet this year? Wondering what to do with all your apples? Try this Apple Crisp recipe I posted last year! It’s probably my favorite dessert to make – it’s super easy and I just love the brown sugar, oats, and apple combo. 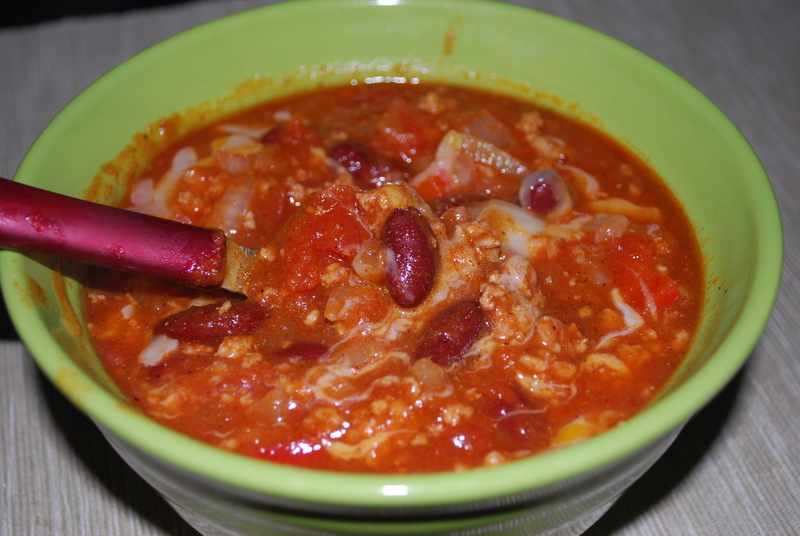 Staying with the Autumn theme, I have an easy, mouthwatering Pumpkin Chili recipe for you that I feel epitomizes Fall cuisine and even better – it’s made in a crock pot! A little nervous about adding pumpkin puree to your chili? Don’t be! The pumpkin puree and spice just adds a pumpkin undertone to the flavor – it definitely doesn’t overpower it and it’s not sweet. It’s the perfect dish for a cool Fall evening. 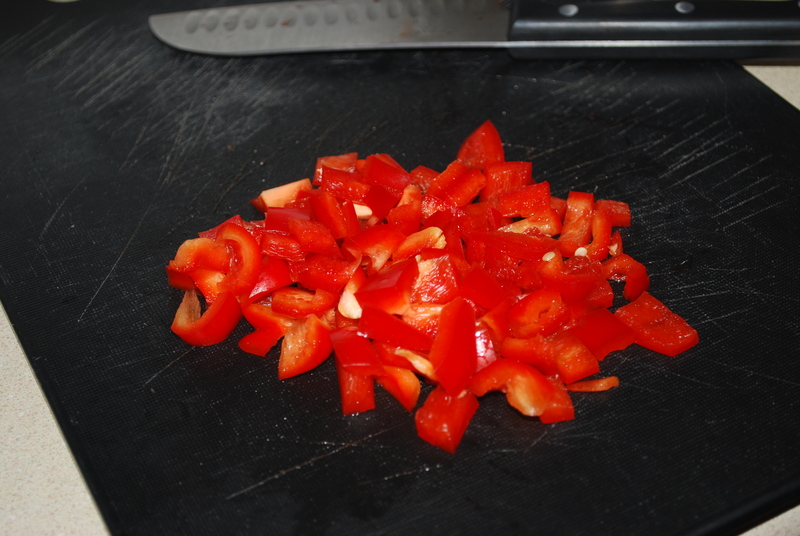 Begin the Crock Pot Pumpkin Chili by dicing 1/2 of a large yellow onion and 1/2 of a red bell pepper. Set them aside. Cook 1 pound lean ground turkey in a pot on medium heat until brown, then drain the juices out. Add the onion and bell pepper into the pot with the turkey and cook them for 5 minutes. Transfer the onion, bell pepper, and turkey into the crock pot. and season with 1/2 tablespoon pumpkin pie spice, 1 tablespoon chili powder (adjust based on heat preference), and 1 tablespoon brown sugar. Mix them all together in the crock pot then add salt and pepper to taste. Cook on the low setting for 4-5 hours. In a pot over medium heat, cook ground turkey until brown then drain. Stir diced onion and bell pepper into the pot with the ground turkey and cook 5 minutes. Transfer ingredients into crock pot. Add beans, tomato juice, diced tomatoes, pumpkin puree, pumpkin pie spice, chili powder, and brown sugar into crock pot. Mix ingredients and season with salt and pepper to taste. Cook on low setting for 4-5 hours. I added another 1/2 tablespoon of chili powder when it was done because I like my chili on the spicier side, but the flavor of this chili is so great that it tastes just as good mild. I am crazy about this chili! I love everything pumpkin and Fall related so I was delighted that this recipe lived up to my expectations. I hope you enjoy it! This entry was posted in Crock Pot, Dinner, Fall and tagged chili, crock pot, Fall, pumpkin, slow cooker, turkey. Bookmark the permalink.